I just love enchiladas. 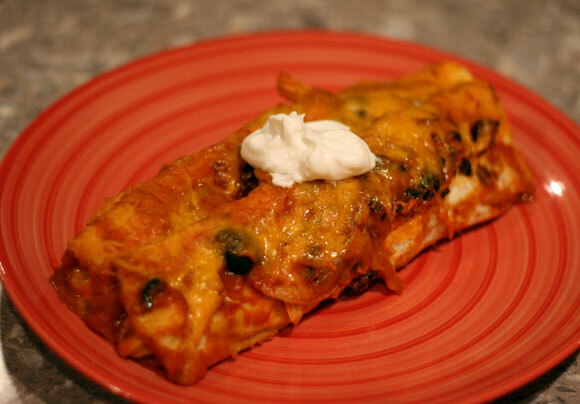 This is a shredded chicken version of my favorite enchilada recipe. I hope you enjoy! These enchiladas freeze well…so make two and freeze one pan. For the sauce: Combine all ingredients together in a blender. Blend until smooth. Heat olive oil in a large skillet over medium/high heat. Add onion, cooking until softened. Remove from heat. Add olives, green onions, 1/2 cup enchilada sauce and 1 heaping cup of shredded cheese. Stir to combine. Pour about 1/2 cup enchilada sauce in a casserole dish. Dip both sides of a tortilla in enchilada sauce and place some of the filling on the tortilla. Roll up and place seam side down. Repeat with remaining tortillas and filling. Cover with remaining sauce and sprinkle with cheese.